The top 9 ITSM tools stacked up: Who's leading the pack? The Top 9 ITSM Offerings Stacked Up: Who's Leading the Pack? 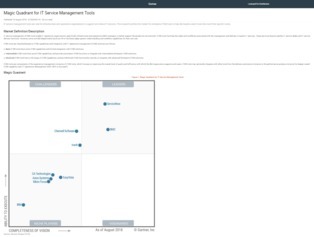 In this Gartner Magic Quadrant report, find out how the top nine ITSM tools on today’s market stack up against one another. Explore the strengths, cautions, and adoption trends around each offering, including those from ServiceNow, BMC, CA Technologies, and more, to get a better of idea which one matches the needs of your I&O team.